With a view to creating a stylish design of lighter, we have developed EASYLITE® with an attractive translucent body. Creatively inspired products are our focus. We excel in meeting the high standards our customers require by providing products that are stylish, trendy, versatile, reliable and safe. 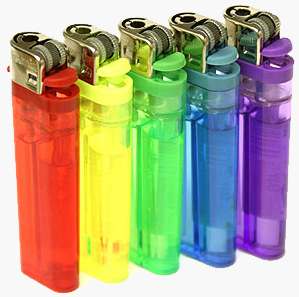 EASYLITE® is available in a variety of bright and vibrant coloured clear bodied lighters and has the advantage of its unique CHILD SAFETY mechanism. Fully guaranteed for quality and safety. EASYLITE® is manufactured to BS EN ISO 9994-2006 65oC and conforms to World Safety Standard ISO CR-13869. EASYLITE® the highest quality, value for money disposable lighter on the market. Visit the Multibrands Online Archive to download product specifications, images and safety information. Easylite is produced by Multibrands International Ltd, headquartered in Bradford, England.